After retuning home from our trip to Paducah, we met up with one of our quilting buddies. She brought this quilt to show what she was working on the week we were gone. Buddy #1 shows Buddy #2 how to make this very cool quilt. Here is my collection of fabrics, with the project in the works. And there is a great Youtube by the author of this pattern. You can find it here. Have a great week, and Happy Quilting! 787 comments? I was totally blown away!!! Thanks to everyone who entered my Sew, Mama, Sew Giveaway. I usually try to respond to every comment left on my blog, but there was NO WAY that I was able to do it this time. But I so loved reading all of the comments. A Big "Thank You" to Sew, Mama, Sew for hosting this fabulous Giveaway Day. Did you find some new blogs to love?? Yep you want to know who won this delicious collection of DS fabrics. Right?? I hope you will stop by her blog and say "hi!". Whew! What an adventurous few days. I hope you were able to visit around on the SMS site and check out all of the other giveaways. Wow! All I can say is that I am totally thunder struck at the comments for my Sew, Mama, Sew Giveaway! Over 700 comments on last count! And a very warm welcome to all of my new followers. I hope that you will come back often and visit with me. Meeting other quilters and bloggers has been such a joy and delight. We are all different, but have so much in common in our love of quilting. I have been visiting many of the blogs from the SMS Giveaway Day. With coffee cup in hand I find that many are new to me. But there are also some great giveaways that are not part of the Giveaway Day. So take a peek. I Have to Say is having a Birthday Giveaway. Stray Stitches is also having a Birthday Giveaway. SewCalGal is having an amazing giveaway for My Design House program. Very cool. Mariliz's Musings is sharing some beautiful fat quarters from her stash. and of course Sew, Mama, Sew will continue through today with their Giveaway Day. Be sure to check out all the lovely blogs that have signed up. And just in case you missed my offering for SMS Giveaway Day, you can comment on Monday's post. Today I am participating in Sew, Mama Sew Giveaway Day. I'd like to welcome all who are new to my blog. This is a wonderful way to visit new blogs and enter for some wonderful giveaway prizes. As we are approaching summer, I thought I would offer some fun summer fabric. So today, let's go on a Picnic at the Fairgrounds! I am giving away 6 fat quarters and one 1/2 yard of Denyse Schmidt's new line of fabric. I am also including these cute matching buttons. It's been really hard to find this fabric in our area, and when I finally found this collection, I wanted to share some with you!! Here's how to enter. No bells or hoops, just leave a comment on this post. For a second entry, let me know if you are a follower of my blog. PLEASE make sure you leave a way to be contacted. If I cannot contact you, another winner will be chosen. The winner will be posted on Thursday May 26th. Thanks so much for stopping by. Enjoy the SMS Giveaway Day! There are so many amazing pictures from Quilt Market last week. I just cannot imagine the energy that was generated in Salt Lake City. As I will never get to Quilt Market, this Moda booth set up at Paducah will have to do. And starting Monday, Sew, Mama, Sew is once again sponsoring the Giveaway Day! They have hundreds of links to blogs and websites offering all kinds of wonderful giveaways. I will be participating again, so I hope you will come back and visit, sign up for my giveaway and then pour yourself a cup of coffee, and enjoy the day. I finally finished the quilting on this table topper. I wanted to try something new so I thought I would try the swag borders as per Mary Mashuta's Foolproof Machine Quilting book. Far from perfect, but it was my first attempt and I like the soft flow it adds to the border. Now I only have to put on the binding and it will be done! This was made with 100% stash fabric, including the backing. So today I am linking up with Clover and Violet and their Stash Project. I don't know why I was amazed to see several Selvage spottings in Paducah. Of all places, Paducah should be the hot spot for any and every kind of quilting. And this gracious lady allowed me to photograph her amazing bag. I think one of her companions said the pattern had been in an issue of McCall's Quilting (?) magazine last year. I've received a couple of comments from readers who toss out their selvages! I'd be happy to take them off your hands. Just stick them in an envelope and send them on :-) We just would not want to fill the landfills with $10 a yard selvages. Okay, go on now and have a Happy Quilting day! 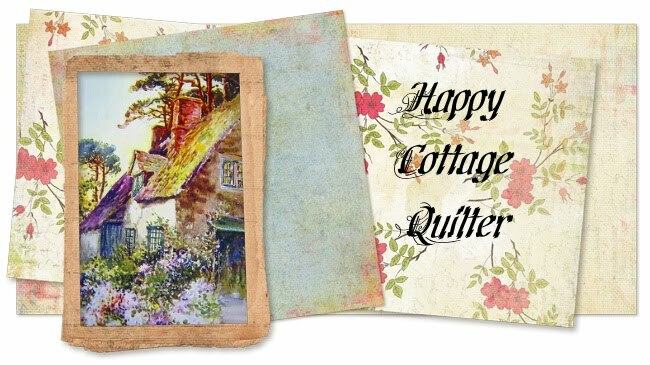 From May 13- 20, join Amy for the Bloggers Quilt Festival. Have you been to the virtual Bloggers Quilt Festival's before? Have you participated?? If you are visiting my blog for the first time - Welcome! It's always fun meeting new friends. In the Spring of 2009, as a very new blogger, I took the plunge and joined Amy in the very first Bloggers Quilt Festival. This time I am sharing a quilt that I made for my daughter. The pattern is Mothers and Daughters and was created by Tara Lynn Darr of Sew Unique Creations. My sister in love and I made this same pattern, and we were both thrilled to meet Tara Lynn personally this year in Paducah. She had an amazing booth located in the Kentucky Mall. I gave this quilt to my daughter for her birthday, and last year when we moved into our new home, my sister in love generously gave my daughter the matching twin. I hope you will enjoy your walk through the Bloggers Quilt Festival. There are so many amazing quilts to see right from the comfort of your own home. Thank you Amy for all of your time and creativity in hosting the Bloggers Quilt Festival. I am looking forward to viewing all of the beautiful quilts from around the world. When the Quiltmaker Blog started their 100 Block tour, I posted their button and let them know that the dates listed were from last year. They thanked me by sending me this issue of 100 Blocks Vol 3!! Woo-hoo, how very exciting. There are so many wonderful blocks made by some very talented designers. and ended up making this quilt. I really like how the quilting turned out. I started this as a baby gift, but only recently finished the quilting. I love to do geometric patterns, and on this one I added the vine with daisies around the sashing and borders. Now I just have to finish up the binding and maybe this baby gift will be sent before the baby turns one!! A quilt of many colors, and two winners! I loved seeing so many of the patterns made up in different color ways when we went through the Quilt in a Day store in Paducah. I've only seen the Barn Quilt made up in bright colors, but the one displayed had more muted tones. Do you like to see patterns made up differently then what appears on the cover? Does it spark your creativity??? Thanks to each one of your who entered the Paducah giveaway. This is the first time that I have had TWO international winners! The winner of the Lattice Work pattern and two yards of fabric is Rosa from Spain. And the winner of the Folk Arts Quilts is Gill from the UK. Congratulations to the winners! I've sent them an email, and will be sending their prizes as soon as I receive their mailing addresses. Let's keep those needles going up and down. Happy Quilting! Yay! I've been looking through my Paducah pictures and I found more vendors samples. Remember to sign up on my giveaway posts. The Lattice Work pattern and fabric can be found on Friday's post. And the Folk Art Quilt book on Saturday's post. One comment per giveaway please. It only seems appropriate to finish up the week with a post about Paducah! Paducah is a small town which comes to life every Spring. What the Quilting world has done for Paducah has taken a little dot on the map and brought it world wide fame. The murals on the flood walls depict the history of Paducah on the Ohio River. "Five generations of baking and food service in the same location since 1884. Buildings are on the National Historic Register. Deli sandwiches made to order w/homemade soup; bagels and pastries at breakfast." And for you, my dear friends, another giveaway. I picked up this book at the Finkle building. It's a great book for piecing and applique. Just leave a comment on todays post. And if you would like to be entered for yesterday's giveaway, don't comment here, leave your comment on the post for 5/6. One comment for each giveaway.